Submitted by Alexander Briones on Tue, 17 Jul, 2018. Regardless of whether you're quietly practicing at home or when you're about to start playing onstage. Before you play your guitar, you need to tune your instrument first to get the most out of it. And to do just that, we have updated this guide for 2018, featuring 11 of the best tuners in the market, divided into groups based on their form factor. Like the previous update, each tuner is chosen based on many years of experience, for their functionality, durability, positive feedback and user recommendations. Tuners come in various shapes and sizes, but they can be classified under three groups based on their form factor and how they listen to your guitar's tuning. The three main groups include clip-on tuners, acoustic tuners and pedal tuners. Note that some might fall under multiple classifications, especially those intended for use with various types of instruments. Without a doubt, Clip-on Tuners are the most popular of all the three types, thanks to their ease of use, practicality and flexibility. After clipping them on the headstock, they utilize "piezo" sensors to hear your guitar sound via the vibrations of the wood, instead of having to rely on a microphone or an input jack. This means that you can tune your guitar in situations where noise from other instruments are unavoidable. While they can be fragile and tiny, they can get the job done with proper handling. More importantly, these tuners are more affordable and they reduce the bulk and weight that you have to carry to your gigs. Because they utilize built-in microphones, Acoustic Tuners rely on actually hearing the sound of your instrument, it's as if a professional musician is helping you tune by ear. The obvious challenge for this type of tuner is that outside noise will easily bleed into its microphone making it hard to use when tuning with other musicians or at noisy gig venues. While this particular technology may seem outdated, they remain the most flexible because you can use them to tune almost any instrument. Pedal Tuners with their tank tough metal exterior are the most reliable and durable of the three, making them ideal for gigging musicians. While they maybe bulkier and heavier, the extra protection, better accuracy and bigger display area that they offer, can often spell the difference between a great gig and a gig gone wrong. It's also worth mentioning that its harder to misplace pedals, so you won't end up having to tune on stage by ear! These are only of use If you have a pickup in your guitar or you're using an acoustic-electric and you don't mind having an extra pedal in your rig. Tuning in smaller venues is one of the many challenges that gigging acoustic guitarists have to face on a regular basis. Since you can't totally mute an acoustic guitar's natural projection, the audience can still hear you pluck your strings as you tune. Although cracking jokes can help distract your audience from the awkward "tuning song", you often have to soften your attack on the strings as you tune so they don't over power your banter with the audience. In line with this, you need a tuner that is sensitive enough to let you tune with the slightest pluck or strum, and you also want it to be as easy to use and discrete as possible so you can transition to playing a song quickly. Clip-on tuners, and acoustic tuners work well for these intimate gigs. In louder band settings or for bigger venues, tuning silently becomes less of a problem, but tuning fast and accurately is demanded, especially when multiple instruments are tuning at the same time and you can no longer trust your ears. These situations require tuners that will let you tune quickly and accurately without having to actually hear the notes yourself. For these types of gigs, you are better off using pedal tuners since you'll probably be plugged into an amplifier or a PA anyway. Clip-on tuners with bigger displays also work well in this situation. There are also many tuner apps for smartphones - they're often free which makes them perfect for using at home, but they're far too cumbersome and prone to audio interference to use when playing live or at important rehearsals with a large number of other musicians. The clip-on and pedal tuners in this guide can be used for tuning electric guitars, as can any of the ones listed in the Handheld & Desktop section where they have a 1/4" input. If you would like to see a more general guitar tuner guide, which also includes rack-mount tuners, then take a look at the Guitar Tuner Guide on Gearank.com. TC Electronic’s innovative polyphonic tuning allows you to strum the guitar and concurrently tune each string instead of the usual one-string-at-a-time method. Thanks to this technology, tuning time is dramatically cut down without sacrificing accuracy or functionality. This technology is also available in clip-on format, carrying over the same tuning precision and innovative multi-string tuning but in a more accessible and affordable format. This impressive tuner lets you tune your guitar in three ways, polyphonic for quick one strum tuning, traditional chromatic if you prefer to tune by string, and an ultra precise +/-0.02 cents "strobe" tuner mode which is ideal when you are setting up your instrument's intonation. One thing that TC Electronic can improve on is the clip mechanism's limited rotation, which makes it a bit harder to get the tuner into certain positions. Other than that, if you want no less than the best tuning technology then you should get the PolyTune Clip. The KLIQ UberTuner is designed to be a reliable tuner that gets the job done without complication. Its a true set-and-forget tuner that's ideal for grab-and-go parlor guitars, where you just want to make music that's in tune, as soon as possible. For fast and precise tuning, the UberTuner is equipped with a high-sensitivity piezo that works in conjunction with its clip design, which holds the tuner securely to better capture sound vibrations. Monitoring is also made easier with its bright full-color display with multiple positioning joints. Multi-instrumentalists will appreciate its built-in transposition settings and tuning modes that are set to work with bass, violin, ukulele and many other instruments. Finally, it runs on a 3V CR2032 lithium battery, which is already included in the package so you can use the KLIQ UberTuner straight out-of-the-box. Snark is widely known for the distinct shape and positioning flexibility of their clip-on tuners. They are also sought after for their accuracy, which is quite good given the low price range that they are being sold at. The Snark ST-2 builds on these positive traits with the addition of a built-in microphone, breaking the limitations of a regular clip-on tuner and essentially turning the ST-2 into an all-around instrument tuner. Other features include a 360 degree rotation mechanism for the display, transpose functions, tuning calibration (415Hz-466Hz) and a tap tempo feature that gives you more use out of the unit as a metronome. Note that it runs on a single CR2032 battery and that Snark do not recommend clipping on parts that are finished in nitrocellulose lacquer, polyurethane, French polish, or oil. With decades worth of experience and specialization under their belt, Peterson Tuners continue to be the go-to brand for many professionals. They built their reputation on precision tuning, with their one tenth of a cent accuracy and they are also known for their tried and tested reliability. The StroboClip HD is an excellent example that showcases the company's best traits, combining their accuracy with the flexibility and portability of a clip-on tuner. Like all their products this tuner has an accuracy that goes down to 1 thousandth of a semitone (0.1 cent), and it comes with a backlit LCD display that lets you know in real-time where you're tuning is at. The StroboClip HD also comes with 50 "Sweetened Tuning" presets for various instruments, all of which are based on Peterson's extensive research, so you can make full use of the tuner to set certain tuning offsets for improved overall sound. This by itself makes this tuner more in-tune to what many guitar players actually need. Along with other features, these all have built-in microphones so they can be used for tuning acoustic guitars and other acoustic instruments. Planet Waves from D’Addario boasts an extensive list of guitar accessories and artist endorsers. Diverse talents such as Pat Metheny, Joe Satriani, Keith Urban and Adrian Belew are just a few of the many professional guitarists that rely on Planet Waves gear to get them through their gigs. As expected, they have designed and produced their own Universal Chromatic Tuner, which as the name implies, comes with a straightforward set of features to make it compatible with more instruments. This simple tuner surprisingly gained quite the popularity, thanks to its affordability and flexibility, which goes beyond what’s expected of its price point. Features include a built-in microphone for tuning acoustics and a ¼” input for pickup equipped instruments. Another noteworthy feature is its combination of LED and LCD display, allowing for good visual monitoring in both well-lit and dark environments. While it doesn’t have anything outside of the ordinary to offer, it does work reliably well as intended. This is ideal if you’re looking for a no-nonsense acoustic guitar tuner that can also tune other instruments. 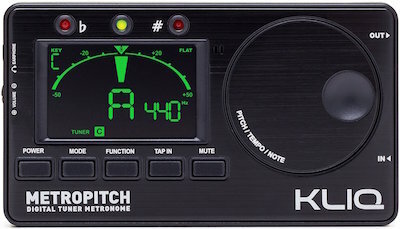 Of the many chromatic tuners in the market, the KLIQ MetroPitch is one of the few hidden gems that give you the best value for your hard earned money. For its price, you get three features in one device, a tuner, a metronome and a tone generator all packed in a compact box. At the core of MetroPitch is the fast and versatile tuner which comes with various tuning modes, transposition settings and pitch calibration. It is designed to handle various types of instruments, having a built-in microphone for audio tuning and a 1/4" input jack for accommodating electric guitars and acoustic guitars with pickups. The ability to behave like a pedal and acoustic tuner is complemented by the wider tuning range of A0-C8, making it usable for bass, guitars and other instruments. The Tap Tempo metronome is an added bonus that surprisingly works really well, with an intuitive jog dial interface that lets you adjust the tempo in real time to your preference. Finally, the 88 Note Tone Generator is ideal for ear training, and can be used as reference notes for alternate tuning. My only concern is that some extra handling care maybe needed to extend the lifetime of this multi-purpose tuner. Still this is the best practice friendly tuner in this list, ideal for serious students of the instrument. Known for their tank tough and affordable pedals, Boss makes equally reliable and durable acoustic tuners. The Boss TU-12EX Chromatic Tuner is the updated version of their popular TU-12, which some professional musicians have been using for more than 10 years. The update adds pedal tuner like qualities with the addition of input and output jacks for acoustic-electric and electric guitars. There's not many extras in this unit, just a straightforward acoustic tuner with meter display that can handle the frequency range of guitar or bass from E0 (20.6Hz) to C8 (4,186Hz). What makes this stand out is how it does what it does reliably for years - and it does so with good precision of +/-1 cent. The meter display maybe old school but it shows you exactly how close you are from your desired tuning. Ironically, the TU-12EX did not follow Boss' usual affordable price point, well at least when it comes to tuners. Still the price is steal considering the lifetime's worth of tuning you can get out of this box. Boss' reputation for building gear that lasts a lifetime is without question, and this applies to their popular chromatic tuner pedal, the TU-3. As expected, it comes with the company's tank tough stompbox form factor, which helps guarantee its longevity. Also expected are the simple set of controls that let you engage/disengage the tuner as you want. What sets it apart from the competition is its 21-segment LED meter with high-brightness mode that provides impressive visual monitoring. Be it in low-light or noon-time, you can clearly see how close you are from the correct pitch with the note name and LED indicators. In addition to its good LED Display and virtually indestructible exterior, Boss designed the TU-3 pedal to double as a power supply for other boss products. This makes owning a TU-3 pedal even more rewarding, reducing the cable clutter in your pedalboard and allowing you to power up to seven pedals - that's more than most acoustic guitarists use. The TU-3's basic overall look can be a letdown to some, but if you can get past the exterior cosmetics, you will realize why this pedal into one of Boss' top selling stompbox. While more popular with electric guitar players because of its black motif, Korg's Pitchblack Chromatic Tuner works just as well for acoustic-electrics guitars. Its road tested exterior makes it more than capable of handling the rigors of regular gigging, and its ability to handle downtuned electric guitars and even bass makes tuning acoustic guitars a breeze. The black color is not just for show, because it creates a better contrast for the eleven segment LED meter to shine through, along with large note name display, regardless of light setting. Having said all that though, the Pitchblack pedal is easily the most visually striking among the tuner pedals listed, and can be an easy pick for many based on looks alone. Giving you the incentive to utilize precious pedalboard space on a tuner, Korg equipped this pedal with DC output which you can use to power up your other pedals. Like the Boss pedal, Pitchblack can double as a power supply, making the cost of acquiring one even more justifiable. While it could have been better if it had more features instead of the redundant display options, this workhorse tuner pedal will make a great addition to anybody's rig. TC Electronic continues to improve on their already popular PolyTune pedal, which is no on its 3rd iteration, with improved accuracy and extra features. Speaking of accuracy, PolyTune 3 can now help you tune to within 0.1 cents of your reference tone via its Strobe tuner mode. It also tunes faster than its predecessor and comes with practical features which include having a switchable true-bypass or buffer circuit, in case you're using long cables. It also features alternate tuning modes, making it easier to tune in between songs where alternate tunings are required. And it comes with more features including auto dimming and auto polyphonic/monophonic switching. While it doesn't really matter how long it takes you to tune when playing at home, it's important to look and sound professional when playing live or rehearsing with a band, and this makes it vital to get a great tuner for these situations - it's what the pros do. If you have any questions about tuners, or tuning, just ask in the comments below and I'll be happy to help. Submitted by Ramesh Jain (not verified) on Thu, 1 Oct, 2015. Hi.. Great in-depth reviews of top acoustic guitar tuners. Submitted by Jason Horton on Sat, 3 Oct, 2015. Glad you liked it Ramesh - thanks for stopping by and I hope we see you again. Submitted by John hobby (not verified) on Sun, 13 Aug, 2017. Submitted by James Rogers (not verified) on Sun, 7 Feb, 2016. I very much enjoyed your article and will use the info during my next tuner purchase. thank you. Submitted by Robert (not verified) on Thu, 21 Jul, 2016. There's a common misconception about tuners such as the Korg Pitchblack. Both the Korg and the Boss Tu-3 have a power output jack. The misconception is that these tuners can therefore power other pedals. That however is really not true. The power out "feature" tends to be more about marketing than substance. You either run a daisy chain directly off a separate power source to your other pedals, or you plug the power source into the tuner and run the daisy chain off of that. In either case, you're doing the same thing for any practical purpose. There's no appreciable benefit with either approach over the other. If you put a battery in the tuner, you can't power other pedals with it. In other words, you're still investing in an external power source regardless. Submitted by Tyler (not verified) on Sun, 9 Jul, 2017. Old article, but no tuner article is complete if the Sonic Research Turbo Tuner pedal is not included. Just as good if not better than any of those listed here. Submitted by Sordann (not verified) on Thu, 1 Nov, 2018. Replacing BOSS TU-10 with bottom pitch at Hz436. Shame that the big brands like BOSS, Polytune don't offer Hz bellow Hz436, 435. Just makes me wonder why ?? ?